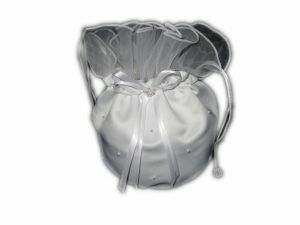 A great addition to any wedding, this beautiful bridal bag is made of white satin and sheer organza ruffles. This bag can be use as a money bag or a beautiful purse for the bride. The bag is the perfect size for those extras that you may want to carry with you. This bridal bag is decorated with satin ribbon bow and scattered pearls. It measures approximately 8.25" x 6.25". This bag closes with a corded drawstring that is accented with a ball of cluster pearls on the tip.